This album was a long time coming. The last “true” Helix studio album (eg: not live, greatest hits or previously unreleased songs) was the excellent It’s A Business Doing Pleasure, twelve years previous to this one. A lot happened in those twelve years, including member changes, management and record company splits, and even a Brian Vollmer solo album (When Pigs Fly). That Helix came out with an album this good with no warning was a pleasant surprise. Almost every song here is quality stuff, with only the instrumental opener “Space Junk” and the jokey closer “Sunny Summer Daze” not fitting in with the serious rocking going on here. A couple of these recordings had previously appeared on Vollmer’s solo CD (with Brian Doerner on drums), but this sounds more like a proper Helix album. The title track features a killer chorus (reminded me of “Rock You” a bit) with those recognizable Helix backing vocals. It’s also the most “party” of all the new songs, some of them being a little darker. Glen “Archie” Gamble (drums) utilizes some interesting cymbal work, a little different from what you usually hear on a Helix record. His playing gives this version of Helix a different rhythm. “Six Feet Underground” has some nice acoustic work, and is extremely catchy. “Panic” has some irresistible vocals. “It’s Hard To Feel the Sunshine When Your Heart is Filled With Rain” might have an overly long title, but the song is amazing, as heard live in concert. A wicked harmonica solo fills the spot with a guitar solo might normally fit. “The Ballad Of Sam & Mary” is a jokey lyric as Helix have done before, but with some serious kick behind it. (Listen for a cameo by Brian’s wife Lynda Vollmer.) It’s only when you get to the closer with its Hawiian guitar that you feel like the album just hit a speedbump. The final track’s saving grace is a guest appearance by former member “Doctor” Doerner on guitar. This album represented a muscular return for Helix, one that kicked off a stream of new Helix records. The band seemed revitalized even as lineups changed, as they continued to follow through with more quality rock and roll. Rockin’ in My Outer Space is a pleasure for fans because it’s different. This is not party music. There are audible dark clouds and angry riffs. The changes in heavy metal over the previous decade are obvious here. The guitars are chunkier and dirtier, and no song has a party-hardy chorus like the days of old, though the title track comes close. Helix are known for a certain brand of rock, and it’s nice when they choose to stretch out. Fear not Helix fans. Brian Vollmer and his gang of little-known but excellent players did not disappoint when they finally decided to release a new album under the Helix Band banner. Aside from the first and last tracks, this is one you’ll be playing all the way through. And heck, you get used to the the first and last tracks after a while. Bonus: In 2005, Helix returned to Sweden to play Sweden Rock. iTunes have one song from their set available for download: “Rock You” This track features the short-lived but very cool six-piece lineup of Brian Vollmer, Archie Gamble, Jeff Fountain (bass), Jim Lawson (guitar), Rainer Wiechmann (guitar and producer) and Cindy Wiechmann (vocals and other instruments). This is the version of Helix that supported this album, and fortunately it was captured live. Check it out for an idea of what this great lineup sounded like live. Helix will be turning 40 in 2014! When I talked to Brian Vollmer back in September, he wasn’t interested in taking a look back this time. Helix did glance back for their 30th in 2004, and this DVD was one of several celebratory releases. The Helix DVD, the 30th Anniversary Concert, is one of the best rock videos I’ve seen. 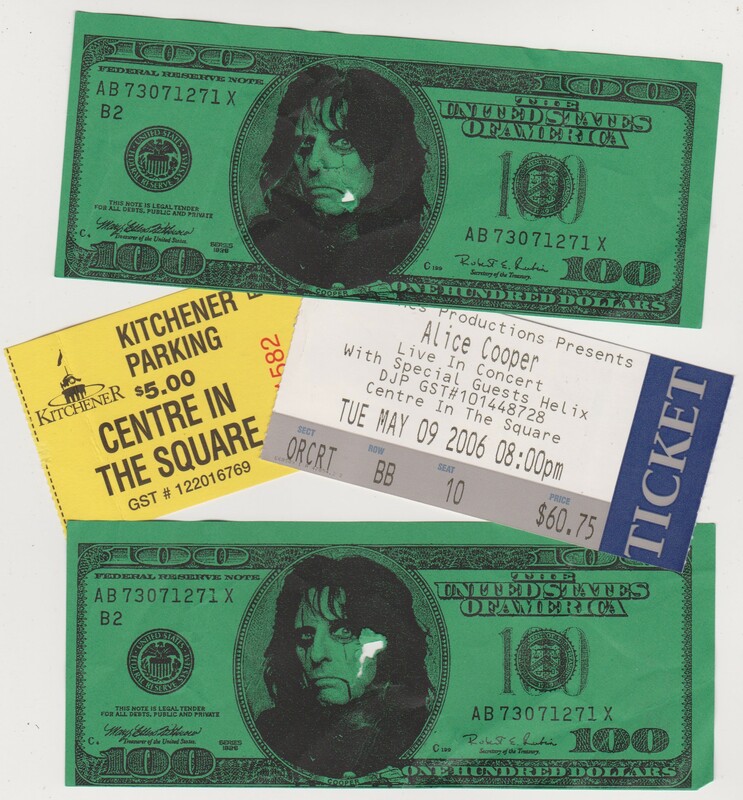 This band has so much history, and most of it was onstage that night, July 17 2004. Vollmer decided to celebrate the 30th in style. Traveling to nearby Brantford and taking over the beautiful Sanderson Centre, Helix unveiled a setlist that honored their entire history, and guested nearly every band member from 1974 to 1990! There were a few conspicuous by their absence, such as longtime bassist Daryl Gray, and a few that we knew couldn’t turn up (the then-missing Mike Uzelac, the late Paul Hackman). However, Brian Vollmer (only remaining original Helix member) proceeded to reunite members of the original 1974 Helix, which had never even been recorded before! From there we go to the lineup responsible for the first two albums (sans Hackman and Uzelac, replaced here by current Helix alum Rainer Weickmann and 1976 bassist Keith “Bert” Zurbrigg, wearing trademark tux). Brian Doerner is introduced as Canada’s greatest drummer, and while Neil Peart and Gary McCracken might disagree, he’s definitely up there. His brother Brent literally steals the show. Singing such lost classics as “Billy Oxygen” and “Crazy Women”, Brent still has that rock star quality. His guitar playing was stellar that night. Other members from back in the day turned up: Leo Niebudek on drums, and then, finally…Greg “Fritz” Hinz, all the way from sunny Florida, behind the skins to celebrate Helix’ late 80’s heyday. Not to be overshadowed, the 2004 Helix lineup returned to the stage for some more hits. “Archie” Gamble is a fantastic drummer, it should be noted, spinning his sticks while creatively keeping the time. The addition of a female vocalist, Cindy Weichmann, allowed the band to perform 1976’s “You’re A Woman Now” for the first time ever with a female vocal, just as it was on the album. The nucleus of this DVD are the six tunes from the 70’s that rarely, if ever, get played today. As great as the hit 80’s material was, the 70’s stuff is what makes this DVD different from any other Helix product you can buy. There are generous bonus features: interviews with Brian and his ever-supportive wife Lynda, candid scenes of rehearsals and Brian trying to get this monster concert together. There are interviews with fans who traveled all the way across the country to see this one show. Best of all are the clips of the old band members, now short-haired, meeting up again for the first time in years. “I’m Brian Drummer and I play Doerner,” says the drummer as he arrives. As Brian stands next to his twin brother Brent, Fritz says, “I never could tell you two apart”. It’s like watching someone’s family reunion video. If you are a Helix fan, you have no excuse for not owning this. If you are only a casual Helix fan and want to check out some of their best stuff, this is the DVD package to get. Not only do you get the hits, but you get the history, and that’s not something to be ignored for a band that turned 30. This stuff below taken from the Wikipedia page, but I don’t care; I wrote the Wikipedia page. All songs written by Brian Vollmer and Paul Hackman except where noted.